Oatmeal is our go-to breakfast on most mornings and, quite surprisingly, something we never seem to tire of. I think this has to do with the fact that oatmeal is such a great canvas for interesting and flavorful toppings and sweeteners. Whether it's cinnamon-laced, popped with a nutty crunch, or piled high with fresh fruit... this little morning mainstay provides a nutritious foundation for a variety of toppings. Though certainly not something I would ever consider a "recipe,' per se, I did happen upon a most beautiful webzine this morning, titled A Little Relish, and in it came across a recipe for Maple Porridge with Grilled Apple and Almonds. It's really all the flavorings I tend to gravitate to, adding fresh apple, chopped almonds, and golden raisins to my bowl most mornings. Yet, I seldom take these additions that extra step... like I tend to think of doing with dinners and most savory meals. 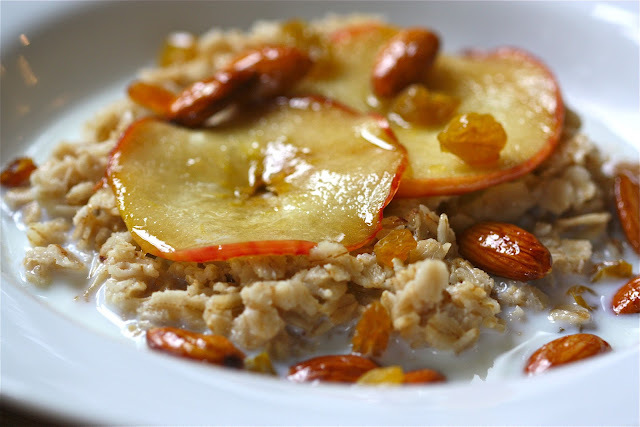 With just a little sweetened sauté of apples and almonds, this little bowl of oats takes on many of the warm, satisfying flavors of apple pie -- buttery caramelized apples, glistening brown-sugared almonds, sweet golden raisins, and a hint of cinnamon. For years, my "go to" cookie for Valentine's Day was a sugar cookie made from a no-fail Betty Crocker recipe (Sugar Cookie Cutouts); one that still gets a good bit of use on other occasions. Though pretty standard fare, this cookie was nonetheless a welcomed Valentine's Day tradition in our home, and one that I might have continued had we never packed up all our belongings and moved to Holland. Arriving in the land of tulips and windmills in the summer of 1996 began, for us, a study in balancing life. Unlike our grab-and-go lifestyle here in the States, the Dutch have a different rhythm; one that was, for me, most poignantly illustrated by the manner in which they enjoyed their coffee... served in a porcelain cup... on a saucer... at a table... with a little cookie tucked in alongside to dip and nibble. Sometimes it was a little gingerbread cookie that was served, or a little sugar cookie, or a mini stroopwafel. It truly didn't matter what cookie arrived as each was such a little treat to enjoy. And then, one day, it was a palmier... and that lovely reaction of isn't it wonderful to receive this generous little morsel changed. More and more I found myself secretly hoping for this crisp, yet delicate little cookie at each and every service. And yes, I'm embarrassed to admit that I was increasingly disappointed if it was not. I found I quickly developed an affinity for this cookie and, with it, a somewhat unattractive quality of being let down when I received my order and spied anything less than a palmier. This subtly sweet, crisp cookie is not only pretty -- with gentle layers of golden, caramelized puff pastry magically transformed to mimic the shape of a heart -- but equally appealing to eat. Sweet flavors of sugar and butter thread throughout its folds, and an ethereal texture lightly gives way with each bite to expose the delicate nature of the many-layered dough. 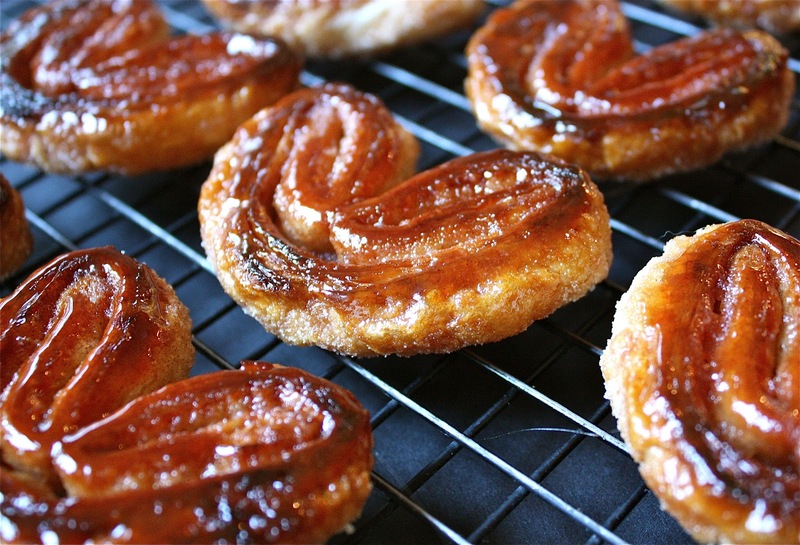 And, with the availability of frozen puff pastry, incredibly easy to make.